Take a trip into the maritime history of Puget Sound aboard the steam ships VIRGINIA V and W.T. 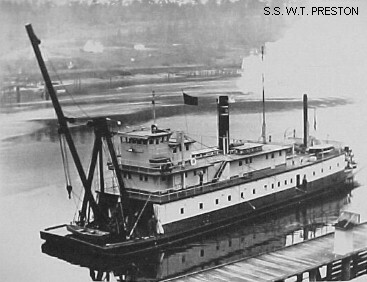 PRESTON, both active when the "mosquito fleet" served the Puget Sound waterfront. Hundreds of steamboats connected the many towns long before roads were built. The age of steam told in this Emmy-winning program. Here is an excerpt from the show by writer/narrator Don McCune: "Here in the northwest, the age of steam echoes down the corridors of time, when steamboats knit together the ravelled skein of settlements that was Puget Sound. Even today, there are those to whom the muffled chug of a steam engine is like an old refrain. They called it the Mosquito Fleet, and for fifty years it nurtured the heart of the city. A steam-driven flotilla which bound together the scattered settlements like a lifeline." The two remaining steamboats in the Seattle area in 1974 are featured in this Emmy-winning episode, the Virginia V and the W.T. Preston. Ken Ayers, Past President of the Puget Sound Maritime Historical Society and seen on this episode says, "The engine of the VIRGINIA V is a three-legged, triple expansion steam engine . . . the old timers call them 'knee-action turbines.' You can see everything flying around. Vessels like this would leave Coleman Dock, and they'd just go out like spokes from a wagon wheel. Going to West Seattle, Suquamish, Indianola, Winslow, and Eagle Harbor, and Bremerton. 50-60 years ago, this was real steamship country." Originally aired under the KOMO title "Steam's Up". Exploration Northwest cameras board the cruiser HAPPY GOLD for a power boat race from Olympia, Washington to Juneau, Alaska. See the first affordable wooden yachts in the Puget Sound dating back to the 1920's. Filmed at the 50th Anniversary of the Capitol-to-Capitol International Predicited-Log Race, this episode focuses on the first leg of the journey from Olympia to Victoria. Archival film footage from 1928-1960 captures additional northwest maritime history. Originally aired under the KOMO title "Guessing the Gold".